CNS stimulants, including Ritalin LA, other methylphenidate-containing products, and amphetamines, have a high potential for abuse and dependence. Assess the risk of abuse prior to prescribing, and monitor for signs of abuse and dependence while on therapy [see Warnings and Precautions (5.1), Drug Abuse and Dependence (9.2, 9.3)]. These highlights do not include all the information needed to use RITALIN LA safely and effectively. See full prescribing information for RITALIN LA. CNS stimulants, including Ritalin LA, other methylphenidate-containing products, and amphetamines, have a high potential for abuse and dependence (5.1, 9.2, 9.3). Assess the risk of abuse prior to prescribing, and monitor for signs of abuse and dependence while on therapy (5.1, 9.2). Ritalin LA is a central nervous system (CNS) stimulant indicated for the treatment of Attention Deficit Hyperactivity Disorder (ADHD) in pediatric patients 6 to 12 years of age (1). Serious Cardiovascular Events: Sudden death has been reported in association with CNS-stimulant treatment at usual doses in pediatric patients with structural cardiac abnormalities or other serious heart problems. In adults, sudden death, stroke, and myocardial infarction have been reported. Avoid use in patients with known structural cardiac abnormalities, cardiomyopathy, serious heart rhythm arrhythmias, or coronary artery disease (5.2). Blood Pressure and Heart Rate Increases: Monitor blood pressure and pulse. Consider the benefits and risk in patients for whom an increase in blood pressure or heart rate would be problematic (5.3). Psychiatric Adverse Reactions: Use of stimulants may cause psychotic or manic symptoms in patients with no prior history or exacerbation of symptoms in patients with preexisting psychiatric illness. Evaluate for preexisting psychotic or bipolar disorder prior to Ritalin LA use (5.4). Priapism: Cases of painful and prolonged penile erections, and priapism have been reported with methylphenidate products. Immediate medical attention should be sought if signs or symptoms of prolonged penile erections or priapism are observed (5.5). Peripheral Vasculopathy, including Raynaud’s Phenomenon: Stimulants used to treat ADHD are associated with peripheral vasculopathy, including Raynaud’s phenomenon. Careful observation for digital changes is necessary during treatment with ADHD stimulants (5.6). Long-Term Suppression of Growth: Monitor height and weight at appropriate intervals in pediatric patients (5.7). Most common adverse reactions (greater than 5% during incidence) were headache, insomnia, upper abdominal pain, decreased appetite, and anorexia (6). Antihypertensive drugs: Monitor blood pressure and heart. Adjust dosage of antihypertensive drug as needed (7). Avoid use of Ritalin LA on the day of surgery if halogenated anesthetics will be used (7). Ritalin LA® is indicated for the treatment of Attention Deficit Hyperactivity Disorder (ADHD), in pediatric patients 6 to 12 years of age [see Clinical Studies (14)]. Prior to initiating treatment with central nervous system (CNS) stimulants, including Ritalin LA, assess for the presence of cardiac disease (i.e., perform a careful history including family history of sudden death or ventricular arrhythmia, and physical examination) [see Warnings and Precautions (5.2)]. Assess the risk of abuse prior to prescribing, and monitor for signs of abuse and dependence while on therapy. Maintain careful prescription records, educate patients about abuse, monitor for signs of abuse and overdose, and periodically reevaluate the need for Ritalin LA use [see Boxed Warning, Warnings and Precautions (5.1), Drug Abuse and Dependence (9)]. The recommended starting dose for Ritalin LA is 20 mg once daily. Increase dosage gradually, in increments of 10 mg weekly. Daily dosage above 60 mg is not recommended. When a lower initial dose is appropriate, patients may begin treatment with 10 mg.
Administer Ritalin LA orally once daily in the morning. Ritalin LA may be swallowed as whole capsules or may be administered by sprinkling the capsule contents on a small amount of applesauce (see specific instructions below). Ritalin LA and/or their contents should not be crushed, chewed, or divided. The capsules may be carefully opened and the beads sprinkled over a spoonful of applesauce. The applesauce should not be warm because it could affect the modified release properties of this formulation. The mixture of drug and applesauce should be consumed immediately in its entirety. The drug and applesauce mixture should not be stored for future use. Pharmacological treatment of ADHD may be needed for extended periods. Periodically reevaluate the long-term use of Ritalin and Ritalin-SR, and adjust dosage as needed. The recommended dose of Ritalin LA for patients currently taking Ritalin twice daily or Ritalin extended-release (SR) is provided below. If switching from other methylphenidate products, discontinue that treatment, and titrate with Ritalin LA using the titration schedule. Do not substitute for other methylphenidate products on a milligram-per-milligram basis, because different methylphenidate base compositions and differing pharmacokinetic profiles [see Description (11), Clinical Pharmacology (12.3)]. Clinical judgment should be used when selecting the starting dose. Daily dosage above 60 mg is not recommended. If paradoxical worsening of symptoms or other adverse reactions occur, reduce the dosage, or, if necessary, discontinue Ritalin LA. If improvement is not observed after appropriate dosage adjustment over a one-month period, the drug should be discontinued. Hypersensitivity to methylphenidate or other components of Ritalin LA. Hypersensitivity reactions such as angioedema and anaphylactic reactions have been reported in patients treated with methylphenidate [see Adverse Reactions (6.1)]. Concomitant treatment with monoamine oxidase inhibitors (MAOIs), or within 14 days following discontinuation of treatment with an MAOI, because of the risk of hypertensive crises [see Drug Interactions (7.1)]. CNS stimulants, including Ritalin LA, other methylphenidate-containing products, and amphetamines, have a high potential for abuse and dependence. Assess the risk of abuse prior to prescribing, and monitor for signs of abuse and dependence while on therapy [see Boxed Warning, Drug Abuse and Dependence (9.2, 9.3)]. Sudden death, stroke and myocardial infarction have been reported in adults with CNS-stimulant treatment at recommended doses. Sudden death has been reported in pediatric patients with structural cardiac abnormalities and other serious heart problems taking CNS stimulants at recommended doses for ADHD. Avoid use in patients with known structural cardiac abnormalities, cardiomyopathy, serious heart rhythm abnormalities, coronary artery disease, and other serious heart problems. Further evaluate patients who develop exertional chest pain, unexplained syncope, or arrhythmias during Ritalin LA treatment. CNS stimulants may induce a manic or mixed mood episode in patients. Prior to initiating treatment, screen patients for risk factors for developing a manic episode (e.g., comorbid or history of depressive symptoms or a family history of suicide, bipolar disorder, or depression). CNS stimulants, at recommended doses, may cause psychotic or manic symptoms (e.g., hallucinations, delusional thinking, or mania) in patients without a prior history of psychotic illness or mania. If such symptoms occur, consider discontinuing Ritalin LA. In a pooled analysis of multiple short-term, placebo-controlled studies of CNS stimulants, psychotic or manic symptoms occurred in approximately 0.1% of CNS stimulant-treated patients, compared to 0 in placebo-treated patients. Stimulants, including Ritalin LA, used to treat ADHD are associated with peripheral vasculopathy, including Raynaud’s phenomenon. Signs and symptoms are usually intermittent and mild; however, very rare sequelae include digital ulceration and/or soft tissue breakdown. Effects of peripheral vasculopathy, including Raynaud’s phenomenon, were observed in post-marketing reports at different times and at therapeutic doses in all age groups throughout the course of treatment. Signs and symptoms generally improve after reduction in dose or discontinuation of drug. Careful observation for digital changes is necessary during treatment with ADHD stimulants. Further clinical evaluation (e.g., rheumatology referral) may be appropriate for certain patients. Careful follow-up of weight and height in pediatric patients ages 7 to 10 years who were randomized to either methylphenidate or non-medication treatment groups over 14 months, as well as in naturalistic subgroups of newly methylphenidate-treated and non-medication treated patients over 36 months (to the ages of 10-13 years), suggests that consistently medicated pediatric patients (i.e., treatment for 7 days per week throughout the year) have a temporary slowing in growth rate (on average, a total of about 2 cm less growth in height and 2.7 kg less growth in weight over 3 years), without evidence of growth rebound during this period of development. Closely monitor growth (weight and height) in pediatric patients treated with CNS stimulants, including Ritalin LA. Patients who are not growing or gaining height or weight as expected may need to have their treatment interrupted. The clinical program for Ritalin LA consisted of 6 studies: 2 controlled clinical studies conducted in children with ADHD aged 6 to 12 years and 4 clinical pharmacology studies conducted in healthy adult volunteers. These studies included a total of 256 subjects; 195 children with ADHD and 61 healthy adult volunteers. The subjects received Ritalin LA in doses of 10 to 40 mg per day. Safety of Ritalin LA was assessed by evaluating frequency and nature of adverse events, routine laboratory tests, vital signs, and body weight. A placebo-controlled, double-blind, parallel-group study was conducted to evaluate the efficacy and safety of Ritalin LA in children with ADHD aged 6 to 12 years. All subjects received Ritalin LA for up to 4 weeks, and had their dose optimally adjusted, prior to entering the double-blind phase of the trial. In the 2-week double-blind treatment phase of this study, patients received either placebo or Ritalin LA at their individually-titrated dose (range 10-40 mg). Adverse reactions with an incidence greater than 5% during the initial 4-week single-blind Ritalin LA titration period of this study were headache, insomnia, upper abdominal pain, appetite decreased, and anorexia. Adverse reactions with an incidence greater than 2% among Ritalin LA-treated subjects, during the 2-week double-blind phase of the clinical study, are shown in Table 2. In the 2-week double-blind treatment phase of a placebo-controlled parallel-group study in children with ADHD, one Ritalin LA-treated subject (1/65, 1.5%) discontinued due to an adverse event (depressed mood). In the single-blind titration period of this study, subjects received Ritalin LA for up to 4 weeks. During this period a total of 6 subjects (6/161, 3.7%) discontinued due to adverse events. The adverse events leading to discontinuation were anger (2 patients), hypomania, anxiety, depressed mood, fatigue, migraine and lethargy. The following adverse reactions have been identified during the post approval use of methylphenidate products. Because these reactions were reported voluntarily from a population of uncertain size, it is not always possible to estimate their frequency reliably or to establish a causal relationship to drug exposure. The list below shows adverse reactions not listed with Ritalin, Ritalin-SR, or Ritalin LA formulations that have been reported with other methylphenidate-containing products. Table 3 presents clinically important drug interactions with Ritalin LA. Clinical Impact Concomitant use of MAOIs and CNS stimulants, including Ritalin LA, can cause hypertensive crisis. Potential outcomes include death, stroke, myocardial infarction, aortic dissection, ophthalmological complications, eclampsia, pulmonary edema, and renal failure [see Contraindications (4)]. Intervention Concomitant use of Ritalin LA with monoamine oxidase inhibitors (MAOIs) or within 14 days after discontinuing MAOI treatment is contraindicated. Clinical Impact Ritalin LA may decrease the effectiveness of drugs used to treat hypertension [see Warnings and Precautions (5.3)]. Intervention Monitor blood pressure and adjust the dosage of the antihypertensive drug as needed. Examples Potassium-sparing and thiazide diuretics, calcium channel blockers, ACE inhibitors, ARBs, beta blockers, centrally acting alpha-2 receptor agonists. Clinical Impact Concomitant use of halogenated anesthetics and Ritalin LA may increase the risk of sudden blood pressure and heart rate increase during surgery. Intervention Avoid use of Ritalin LA in patients being treated with anesthetics on the day of surgery. In studies conducted in rats and rabbits, methylphenidate was administered orally at doses of up to 75 and 200 mg/kg/day, respectively, during the period of organogenesis. Teratogenic effects (increased incidence of fetal spina bifida) were observed in rabbits at the highest dose, which is approximately 40 times the maximum recommended human dose (MRHD) on a mg/m2 basis. The no effect level for embryo-fetal development in rabbits was 60 mg/kg/day (11 times the MRHD on a mg/m2 basis). There was no evidence of specific teratogenic activity in rats, although increased incidences of fetal skeletal variations were seen at the highest dose level (7 times the MRHD on a mg/m2 basis), which was also maternally toxic. The no effect level for embryo-fetal development in rats was 25 mg/kg/day (2 times the MRHD on a mg/m2 basis). When methylphenidate was administered to rats throughout pregnancy and lactation at doses of up to 45 mg/kg/day, offspring body weight gain was decreased at the highest dose (4 times the MRHD on a mg/m2 basis), but no other effects on postnatal development were observed. The no effect level for pre- and postnatal development in rats was 15 mg/kg/day (equal to the MRHD on a mg/m2 basis). The safety and effectiveness of Ritalin LA for the treatment of ADHD have been established in pediatric patients 6 to 12 years. The safety and effectiveness of Ritalin LA in pediatric patients less than 6 years have not been established. The long-term efficacy of Ritalin LA in pediatric patients has not been established. Growth should be monitored during treatment with stimulants, including Ritalin LA. Pediatric patients who are not growing or gaining weight as expected may need to have their treatment interrupted [see Warnings and Precautions (5.7)]. In a study conducted in young rats, methylphenidate was administered orally at doses of up to 100 mg/kg/day for 9 weeks, starting early in the postnatal period (postnatal Day 7) and continuing through sexual maturity (postnatal Week 10). When these animals were tested as adults (postnatal Weeks 13 to 14), decreased spontaneous locomotor activity was observed in males and females previously treated with 50 mg/kg/day (approximately 6 times the MRHD on a mg/m2 basis) or greater, and a deficit in the acquisition of a specific learning task was seen in females exposed to the highest dose (12 times the MRHD on a mg/m2 basis). The no effect level for juvenile neurobehavioral development in rats was 5 mg/kg/day (half the MRHD on a mg/m2 basis). The clinical significance of the long-term behavioral effects observed in rats is unknown. Ritalin LA has not been studied in the geriatric population. Ritalin LA contains methylphenidate hydrochloride, a Schedule II controlled substance. CNS stimulants, including Ritalin LA, have a high potential for abuse. Abuse is characterized by impaired control over drug use despite harm, and craving. Signs and symptoms of CNS stimulant abuse include increased heart rate, respiratory rate, blood pressure, and/or sweating, dilated pupils, hyperactivity, restlessness, insomnia, decreased appetite, loss of coordination, tremors, flushed skin, vomiting, and/or abdominal pain. Anxiety, psychosis, hostility, aggression, and suicidal or homicidal ideation have also been observed. Abusers of CNS stimulants may chew, snort, inject, or use other unapproved routes of administration which may result in overdose and death [see Overdosage (10)]. To reduce the abuse of CNS stimulants including Ritalin LA, assess the risk of abuse prior to prescribing. After prescribing, keep careful prescription records, educate patients and their families about abuse and on proper storage and disposal of CNS stimulants [see How Supplied/Storage and Handling (16)], monitor for signs of abuse while on therapy, and re-evaluate the need for Ritalin and Ritalin-SR use. Tolerance (a state of adaptation in which exposure to a drug results in a reduction of the drug’s desired and/or undesired effects over time) can occur during chronic therapy with CNS stimulants, including Ritalin LA. Physical dependence (which is manifested by a withdrawal syndrome produced by abrupt cessation, rapid dose reduction, or administration of an antagonist) may occur in patients treated with CNS stimulants including Ritalin and Ritalin SR. Withdrawal symptoms after abrupt cessation following prolonged high-dosage administration of CNS stimulants include dysphoric mood; fatigue; vivid, unpleasant dreams; insomnia or hypersomnia; increased appetite; and psychomotor retardation or agitation. Signs and symptoms of acute overdosage, resulting principally from overstimulation of the central nervous system and from excessive sympathomimetic effects, may include the following: nausea, vomiting, diarrhea, restlessness, anxiety, agitation, tremors, hyperreflexia, muscle twitching, convulsions (which may be followed by coma), euphoria, confusion, hallucinations, delirium, sweating, flushing, headache, hyperpyrexia, tachycardia, palpitations, cardiac arrhythmias, hypertension, hypotension, tachypnea, mydriasis, dryness of mucous membranes, and rhabdomyolysis. Consult with a Certified Poison Control Center (1-800-222-1222) for the latest recommendations. Ritalin LA contains methylphenidate hydrochloride, a CNS stimulant. Ritalin LA extended-release capsules is an extended-release formulation of methylphenidate for oral administration with a bi-modal release profile. Each bead-filled Ritalin LA capsule contains half the dose as immediate-release beads and half as enteric-coated beads, thus providing an immediate release of methylphenidate and a second delayed release of methylphenidate. Methylphenidate hydrochloride USP is a white, odorless, fine crystalline powder. Its solutions are acid to litmus. It is freely soluble in water and in methanol, soluble in alcohol, and slightly soluble in chloroform and in acetone. Its molecular weight is 269.77 g/mol. Methylphenidate hydrochloride is a central nervous system (CNS) stimulant. The mode of therapeutic action in ADHD is not known. Methylphenidate is a racemic mixture comprised of the d- and l-threo enantiomers. The d-threo enantiomer is more pharmacologically active than the l-threo enantiomer. Methylphenidate is thought to block the reuptake of norepinephrine and dopamine into the presynaptic neuron and increase the release of these monoamines into the extraneuronal space. A formal QT study has not been conducted in patients taking Ritalin LA. The effect of dexmethylphenidate, the pharmacologically active d-enantiomer of Ritalin, on the QT interval was evaluated in a double-blind, placebo- and open-label active (moxifloxacin)-controlled study following single doses of dexmethylphenidate XR 40 mg (maximum recommended adult total daily dosage) in 75 healthy volunteers. ECGs were collected up to 12 hours postdose. Frederica’s method for heart rate correction was employed to derive the corrected QT interval (QTcF). The maximum mean prolongation of QTcF intervals was less than 5 ms, and the upper limit of the 90% confidence interval (CI) was below 10 ms for all time matched comparisons versus placebo. This was below the threshold of clinical concern and there was no evident-exposure response relationship. 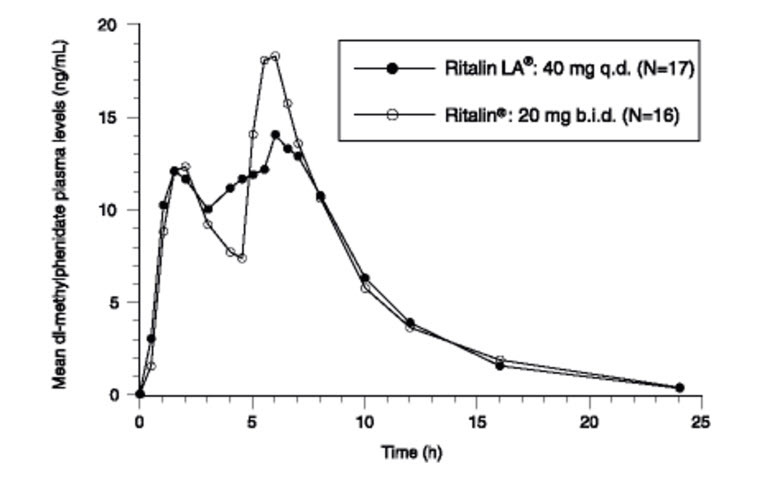 Ritalin LA produces a bi-modal plasma concentration-time profile (i.e., 2 distinct peaks approximately 4 hours apart) when administered orally to children diagnosed with ADHD and healthy adults. No accumulation of methylphenidate is expected following multiple once daily oral dosing with Ritalin LA, however, there is a slight upward trend in the methylphenidate area under the curve (AUC) and peak plasma concentrations (Cmax1 and Cmax2) after oral administration of Ritalin LA 20 mg and 40 mg capsules to adults. The absolute oral bioavailability of methylphenidate in children was 22 ± 8% for d-methylphenidate and 5 ± 3% for l-methylphenidate. The relative bioavailability of Ritalin LA given once daily is comparable to the same total dose of Ritalin tablets given in 2 doses 4 hours apart in both children and adults. The initial rate of absorption for Ritalin LA is similar to that of Ritalin tablets as shown by the similar rate parameters between the 2 formulations, i.e., initial lag time (Tlag), first peak concentration (Cmax1), and time to the first peak (Tmax1), which is reached in 1 to 3 hours. The mean time to the interpeak minimum (Tminip), and time to the second peak (Tmax2) are also similar for Ritalin LA given once daily and Ritalin tablets given in 2 doses 4 hours apart (see Figure 1 and Table 1), although the ranges observed are greater for Ritalin LA. Ritalin LA given once daily exhibits a lower second peak concentration (Cmax2), higher interpeak minimum concentrations (Cminip), and less peak and trough fluctuations than Ritalin tablets given in 2 doses given 4 hours apart. This is due to an earlier onset and more prolonged absorption from the delayed-release beads (see Figure 1 and Table 4). An in vitro study was conducted to explore the effect of alcohol on the release characteristics of methylphenidate from the Ritalin LA 40 mg capsule dosage form. At an alcohol concentration of 40% there was a 98% release of methylphenidate in the first hour. The results with the 40 mg capsule are considered to be representative of the other available capsule strengths. Binding to plasma proteins is low (10% to 33%). The volume of distribution was 2.65 ± 1.11 L/kg for d-methylphenidate and 1.80 ± 0.91 L/kg for l-methylphenidate. The systemic clearance is 0.40 ± 0.12 L/h/kg for d-methylphenidate and 0.73 ± 0.28 L/h/kg for l-methylphenidate. In studies with Ritalin LA and Ritalin tablets in adults, methylphenidate from Ritalin tablets is eliminated from plasma with an average half-life of about 3.5 hours, (range 1.3 to 7.7 hours). In children the average half-life is about 2.5 hours, with a range of about 1.5 to 5.0 hours. The rapid half-life in both children and adults may result in un-measurable concentrations between the morning and mid-day doses with Ritalin tablets. No accumulation of methylphenidate is expected following multiple once a day oral dosing with Ritalin LA. The half-life of ritalinic acid is about 3 to 4 hours. The absolute oral bioavailability of methylphenidate in children was 22 ± 8% for d-methylphenidate and 5 ± 3% for l-methylphenidate, suggesting pronounced presystemic metabolism. Biotransformation of methylphenidate by the carboxylesterase CES1A1 is rapid and extensive leading to the main, de-esterified metabolite α-phenyl-2-piperidine acetic acid (ritalinic acid), which has little or no pharmacologic activity. Only small amounts of hydroxylated metabolites (e.g., hydroxymethylphenidate and hydroxyritalinic acid) are detectable in plasma. Therapeutic activity is principally due to the parent compound. After oral administration of an immediate release formulation of methylphenidate, 78% to 97% of the dose is excreted in the urine and 1% to 3% in the feces in the form of metabolites within 48 to 96 hours. Only small quantities (less than 1%) of unchanged methylphenidate appear in the urine. Most of the dose is excreted in the urine as ritalinic acid (60% to 86%), the remainder being accounted for by minor metabolite. There were no apparent gender differences in the pharmacokinetics of methylphenidate between healthy male and female adults when administered Ritalin LA. There is insufficient experience with the use of Ritalin LA to detect ethnic variations in pharmacokinetics. The pharmacokinetics of Ritalin LA was examined in 18 children with ADHD between 7 and 12 years of age. Fifteen of these children were between 10 and 12 years of age. The time until the between peak minimum, and the time until the second peak were delayed and more variable in children compared to adults. After a 20-mg dose of Ritalin LA, concentrations in children were approximately twice the concentrations observed in 18 to 35 year old adults. This higher exposure is almost completely due to the smaller body size and total volume of distribution in children, as apparent clearance normalized to body weight is independent of age. Ritalin LA has not been studied in renally-impaired patients. Renal impairment is expected to have minimal effect on the pharmacokinetics of methylphenidate since less than 1% of a radiolabeled dose is excreted in the urine as unchanged compound, and the major metabolite (ritalinic acid), has little or no pharmacologic activity. Ritalin LA has not been studied in patients with hepatic impairment. Hepatic impairment is expected to have minimal effect on the pharmacokinetics of methylphenidate since it is metabolized primarily to ritalinic acid by nonmicrosomal hydrolytic esterases that are widely distributed throughout the body. In a lifetime carcinogenicity study carried out in B6C3F1 mice, methylphenidate caused an increase in hepatocellular adenomas, and in males only, an increase in hepatoblastomas at a daily dose of approximately 60 mg/kg/day. This dose is approximately 2 times the maximum recommended human dose (MRHD) in children on a mg/m2 basis. Hepatoblastoma is a relatively rare rodent malignant tumor type. There was no increase in total malignant hepatic tumors. The mouse strain used is sensitive to the development of hepatic tumors, and the significance of these results to humans is unknown. Methylphenidate did not cause any increase in tumors in a lifetime carcinogenicity study carried out in F344 rats; the highest dose used was approximately 45 mg/kg/day, which is approximately 4 times the MRHD in children on a mg/m2 basis. Methylphenidate was not mutagenic in the in vitro Ames reverse mutation assay, in the in vitro mouse lymphoma cell forward mutation assay, or in the in vitro chromosomal aberration assay using human lymphocytes. Sister chromatid exchanges and chromosome aberrations were increased, indicative of a weak clastogenic response, in an in vitro assay in cultured Chinese Hamster Ovary (CHO) cells. Methylphenidate was negative in vivo in males and females in the mouse bone marrow micronucleus assay. Methylphenidate did not impair fertility in male or female mice that were fed diets containing the drug in an 18-week continuous breeding study. The study was conducted at doses up to 160 mg/kg/day, approximately 10-fold the highest recommended dose in adolescents on a mg/m2 basis. Ritalin LA was evaluated in a randomized, double-blind, placebo-controlled, parallel group clinical study in which 134 children, ages 6 to 12, with DSM-IV diagnoses of ADHD received a single morning dose of Ritalin LA in the range of 10 to 40 mg/day, or placebo, for up to 2 weeks. The doses used were the optimal doses established in a previous individual dose titration phase. In that titration phase, 53 of 164 patients (32%) started on a daily dose of 10 mg and 111 of 164 patients (68%) started on a daily dose of 20 mg or higher. The patient’s regular schoolteacher completed the Conners ADHD/DSM-IV Scale for Teachers (CADS-T) at baseline and the end of each week. The CADS-T assesses symptoms of hyperactivity and inattention. The change from baseline of the (CADS-T) scores during the last week of treatment was analyzed as the primary efficacy parameter. 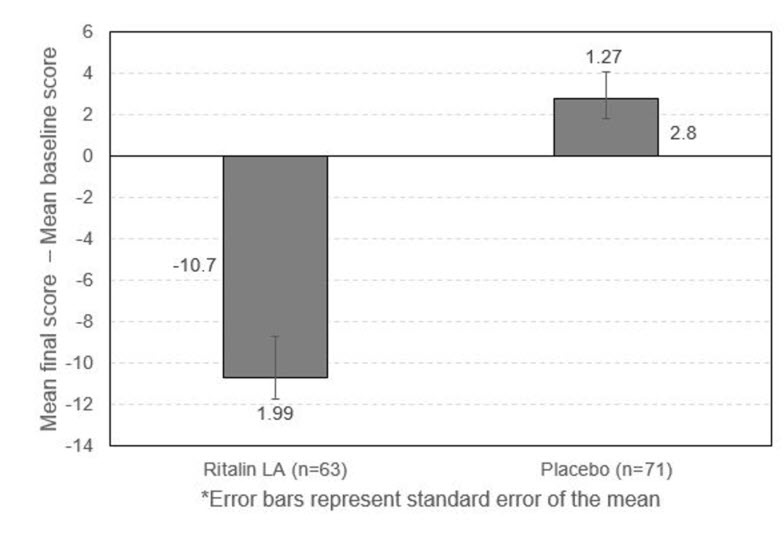 Patients treated with Ritalin LA showed a statistically significant improvement in symptom scores from baseline [Mean (final score - baseline) = -10.7 points] over patients who received placebo [Mean (final score - baseline) = +2.8 points]. The lower the final score on the CADS-T scale from baseline, the less severe the disease is. This demonstrates that a single morning dose of Ritalin LA exerts a treatment effect in ADHD. Comply with local laws and regulations on drug disposal of CNS stimulants. Dispose of remaining, unused, or expired Ritalin LA by a medicine takeback program or by an authorized collector registered with the Drug Enforcement Administration. If no take-back program or authorized collector is available, mix Ritalin LA with an undesirable, nontoxic substance to make it less appealing to children and pets. Place the mixture in a container such as a sealed plastic bag and discard Ritalin LA in the household trash. Advise patients that Ritalin LA is a controlled substance, and it can be abused and lead to dependence. Instruct patients that they should not give Ritalin LA to anyone else. Advise patients to store Ritalin LA in a safe place, preferably locked, to prevent abuse. Advise patients to comply with laws and regulations on drug disposal. Advise patients to dispose of remaining, unused, or expired Ritalin LA by a medicine take-back program if available [see Boxed Warning, Warnings and Precautions (5.1), Drug Abuse and Dependence (9.1, 9.2, 9.3), How Supplied/Storage and Handling (16)]. Advise patients that there is a potential serious cardiovascular risk including sudden death, myocardial infarction, stroke, and hypertension with Ritalin LA use. Instruct patients to contact a healthcare provider immediately if they develop symptoms such as exertional chest pain, unexplained syncope, or other symptoms suggestive of cardiac disease [see Warnings and Precautions (5.2)]. Instruct patients that Ritalin LA can cause elevations of their blood pressure and pulse rate [see Warnings and Precautions (5.3)]. Advise patients that Ritalin LA, at recommended doses, can cause psychotic or manic symptoms, even in patients without prior history of psychotic symptoms or mania [see Warnings and Precautions (5.4)]. Advise patients of the possibility of painful or prolonged penile erections (priapism). Instruct them to seek immediate medical attention in the event of priapism [see Warnings and Precautions (5.5)]. Instruct patients beginning treatment with Ritalin LA about the risk of peripheral vasculopathy, including Raynaud’s Phenomenon, and associated signs and symptoms: fingers or toes may feel numb, cool, painful, and/or may change color from pale, to blue, to red. Instruct patients to report to their physician any new numbness, pain, skin color change, or sensitivity to temperature in fingers or toes. Instruct patients to call their physician immediately with any signs of unexplained wounds appearing on fingers or toes while taking Ritalin LA. Further clinical evaluation (e.g., rheumatology referral) may be appropriate for certain patients [see Warnings and Precautions (5.6)]. Advise patients that Ritalin LA may cause slowing of growth and weight loss [see Warnings and Precautions (5.7)]. Advise patients to avoid alcohol while taking Ritalin LA. Consumption of alcohol while taking Ritalin LA may result in a more rapid release of the dose of methylphenidate [see Clinical Pharmacology (12.3)]. What is the most important information I should know about RITALIN LA? RITALIN LA is a federal controlled substance (CII) because it can be abused or lead to dependence. Keep RITALIN LA in a safe place to prevent misuse and abuse. Selling or giving away RITALIN LA may harm others, and is against the law. Tell your doctor if you or your child have ever abused or been dependent on alcohol, prescription medicines, or street drugs. Your doctor should check you or your child carefully for heart problems before starting RITALIN LA. Your doctor should check you or your child’s blood pressure and heart rate regularly during treatment with RITALIN LA. Call your doctor right away if you or your child has any signs of heart problems such as chest pain, shortness of breath, or fainting while taking RITALIN LA. Call your doctor right away if you or your child have any new or worsening mental symptoms or problems while taking RITALIN LA, especially seeing or hearing things that are not real, believing things that are not real, or are suspicious. RITALIN LA is a central nervous system stimulant prescription medicine. It is used for the treatment of Attention Deficit Hyperactivity Disorder (ADHD). RITALIN LA may help increase attention and decrease impulsiveness and hyperactivity in patients with ADHD. RITALIN LA should be used as a part of a total treatment program for ADHD that may include counseling or other therapies. It is not known if RITALIN LA is safe and effective in children under 6 years of age. are allergic to methylphenidate hydrochloride, or any of the ingredients in RITALIN LA. See the end of this Medication Guide for a complete list of ingredients in RITALIN LA. if you are pregnant or plan to become pregnant. It is not known if RITALIN LA will harm your unborn baby. Talk to your doctor if you are pregnant or plan to become pregnant. if you are breastfeeding or plan to breastfeed. RITALIN LA passes into your breast milk. You and your doctor should decide if you will take RITALIN LA or breastfeed. Tell your doctor about all of the medicines that you or your child take including prescription and over-the-counter medicines, vitamins, and herbal supplements. RITALIN LA and some medicines may interact with each other and cause serious side effects. Sometimes the doses of other medicines will need to be adjusted while taking RITALIN LA. Your doctor will decide whether RITALIN LA can be taken with other medicines. Do not start any new medicine while taking RITALIN LA without talking to your doctor first. How should RITALIN LA be taken? Take RITALIN LA once a day in the morning. RITALIN LA is an extended-release capsule. Do not chew or crush RITALIN LA capsules or the medicine inside the capsule. Swallow RITALIN LA capsules whole with water or other liquids. If you cannot swallow the capsule whole, open it and sprinkle the medicine over a spoonful of applesauce. Swallow the applesauce and medicine mixture without chewing. Follow with a drink of water or other liquid. You should avoid drinking alcohol during treatment with RITALIN LA. This may cause a faster release of RITALIN LA. In case of poisoning, call your poison control center at 1-800-222-1222 right away or go to the nearest hospital emergency room. What are possible side effects of RITALIN LA? See “What is the most important information I should know about RITALIN LA?” for information on reported heart and mental problems. Tell your doctor if you or your child have numbness, pain, skin color change, or sensitivity to temperature in the fingers or toes. Call your doctor right away if you have or your child has any signs of unexplained wounds appearing on fingers or toes while taking RITALIN LA. How should I store RITALIN LA? Store RITALIN LA in a safe place and in a tightly closed container at room temperature, 68°F to 77°F (20°C to 25°C). Dispose of remaining, unused, or expired RITALIN LA by a medicine take-back program at authorized collection sites such as retail pharmacies, hospital or clinic pharmacies, and law enforcement locations. If no take-back program or authorized collector is available, mix RITALIN LA with an undesirable, nontoxic substance such as dirt, cat litter, or used coffee grounds to make it less appealing to children and pets. Place the mixture in a container such as a sealed plastic bag and throw away (discard) RITALIN LA in the household trash. Keep RITALIN LA and all medicines out of the reach of children. Medicines are sometimes prescribed for purposes other than those listed in a Medication Guide. You can ask your pharmacist or doctor for information about RITALIN LA that is written for healthcare professionals. Do not use RITALIN LA for a condition for which it was not prescribed. Do not give RITALIN LA to other people, even if they have the same symptoms. It may harm them and it is against the law. What are the ingredients in RITALIN LA? RITALIN LA® is a trademark of Novartis AG. For more information, call 1-888-669-6682.